We asked Ottavio di Canossa three questions (up on the left with his father Alvise and again at the left bottom of this page) who has established a Pasta Factory in his estate Cuniola, which his historical family has owned since the beginning of 1900: the Factory produces only pasta of very high quality, trademarked Pasta di Canossa, supervising the whole production cycle, from the seeds to the final product. Storci has appointed the pasta Factory as its permanent training centre, Storci Pasta Centre – Training and Research. 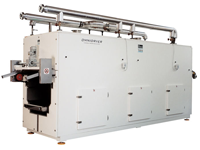 We are not talking of a simple lab, but of a real pasta factory equipped with Storci lines and totally able to produce. Through the training centre, the Research and Development area, one of the pillars of Storci‘s activity, has reached a new dimension and gives us the opportunity of testing and developing new machinery and products in an operational framework. There are also additional benefits for those who are going to choose us as their partner: both the training, carried out on the same machinery that will be used in one’s own factory and the pasta production, using the raw materials, new recipes and products ‘ tests chosen by the Clients.asta con le materie prime scelte dal cliente e i test di nuove ricette e prodotti. Ottavio, which are the main features of your Pasta? First of all we use durum wheat semolato not durum wheat semolina. This is the most important difference between us and our competitors. Three years ago my father and I started to look for a pasta which “tasted pasta”. That was due to our personal taste although it might seem a paradox, as the durum wheat semolina sold today is too much refined and tasteless and lacks that real flavour that we were looking for. 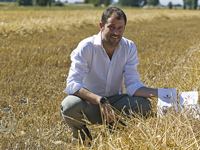 For this reason, following some tests we had made, we took some of our wheat to a nearby mill and some new tests were carried out, using also the semolato which is a manufactured semi –whole durum wheat and has a larger quantity of fibre. 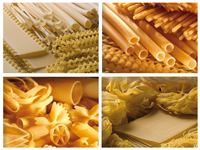 Actually in the final result our pasta has 4% of fibre whereas the standard one has 1,5-1,7% of fibre and the whole durum wheat pasta 13-14%. The larger quantity of fibre, the mixture of grains used along with our tests, have made us achieve a very satisfying result, for both the taste and the flavour. What made you choose Storci as a partner? Storci has presented a project which goes beyond the simple supply of a pasta making machine, a package which includes not only a technological development but also a commercial advancement of our products, monitoring constantly and attentively our production. All this suited entirely our needs because not only did we look for a better quality line (this info had been confirmed by our tests) but we also wanted a solid and very experienced partner, which would have liked to invest in research, development and new productions. Storci has turned your factory into its permanent training Centre. How do you feel about it? We feel very positive about it: that means that we have at our disposal a company that we regard as one at the top level in the world of pasta lines production which carries out researches, training and development in our premises.That also means keeping up our good name, learning new procedures and being at the forefront for all that refers to raw materials and products. This is our best calling card and we are very proud Storci has chosen our pasta Factory for such an important project adding value to the quality of our products. Making pasta does not mean only business for us since we are very aware of other chains of events that unfold in this sector. When I talk of our project, all the people are very impressed with the idea of zero mile production chain but the interest in this project increases when I bring up the subject of the training to be done inside our Factory. Everything leads to our main goal: reaching a top quality.